Barbaro fouled Smaker and asked for a title match. Two quick falls and a less than satisfying third fall to decide. 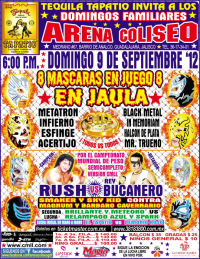 Rush accidentally dropkicked the ref, Bucanero got a visual pin, Bucanero checked on the ref, Rush grabbed Bucanero and submitted for his loss. Luchadors were required to stay in 8 minutes. Order of escape was Acertijo, Metraton, Halcon de Plata, Mr. Trueno, Black Metal, and Infierno. 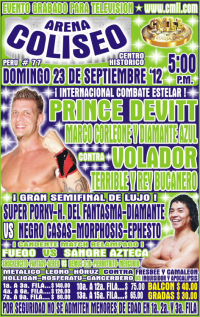 As normal under CMLL rules, the last two - In Memoriam & Esfinge - faced off in a one fall match, and Esfinge won with a puente olimpico. 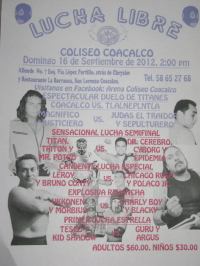 In Memoriam was revealed to be Manual Campos Ornelas, from Guadalajara, 3 years a wrestler, 20 years a wrestler. 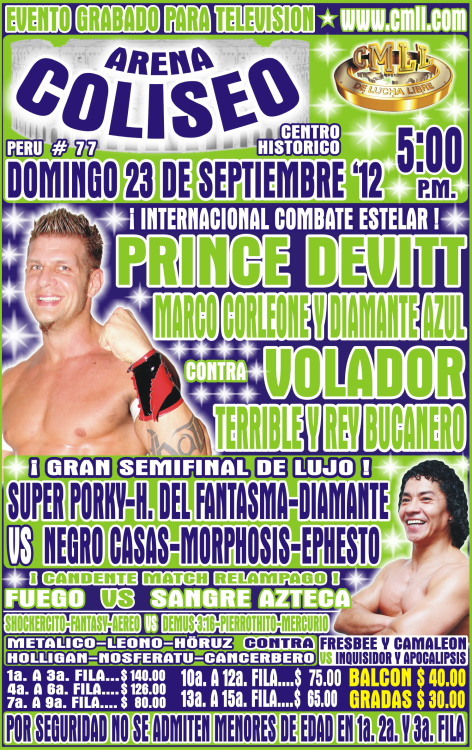 Centauro de Fuego's first match since April. Gallo replaced Soberano, won in his debut. Amapola led her team to win, challenged Marcela for a title match for next week. A much more successful match for Mistico this time. Seconds were Comandante and Mistico. Terrible kept his title. 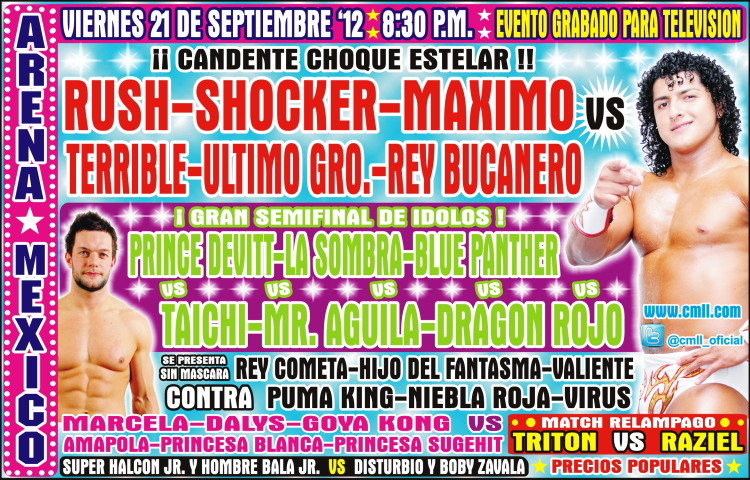 6) Marco Corleone, Máximo, Rush b Mephisto, Mr. Niebla, Volador Jr.
Mascara Dorada is in Japan, won't be on the show. Total street fight. Both were counted out brawling in between (and with) the chairs in the crowd, which seemed to count as two falls. Terrible fouled Rush for the loss. 3) Bruno Conty & Leroy vs Chicago Rush & Polaco Jr.
2) Krosty & Rey Maya b Ángel Infernal & Full Back Jr.
3) Pirata del Caribe, Súper Sol, Torbellino b Huracán Guerrero, Thunderman II, Thunderman Jr.
Comando with a slight upset win. Nitro was replaced by Artillero. Straight falls for rudos. All straight falls for the rudos. Fuego eliminated Virus in the second, but Virus tripped him up from outside to set up a Misterioso pinfall. Fuego demanded a rematch with Virus. Tecnicos take 2/3, Niebla fouling Devitt. Bad match. Shocker was way out of it and the crowd let him know they weren't happy. Sombra tried. Shadow & Stratus were added to the match. Vaquerita replaced Shitara and switched sides with Muneca. Said to be a very good 30 minute match. 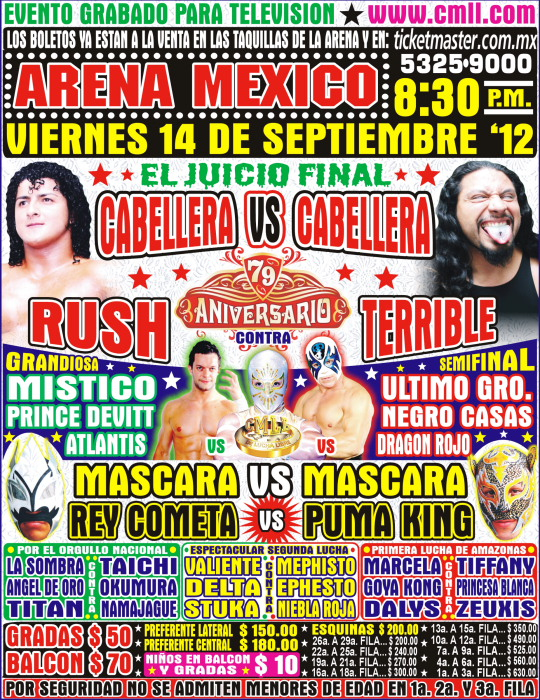 Volador took the first, Mascara took the second. Both guys escaped the usual finishes. Volador's second (name not given, does not look familiar) accidentally hit Volador with a chair in the third. Robin (Mascara's second) dropkicked him out and toped him, and Mascara put on the campana for the win. Fans gave the match a standing ovation. 1) Sádico b Javier Cruz Jr. Stigma's debut, feuding with Barbaro. Barbaro snuck in a foul for the win. Seconds were Arkangel & Metatron. 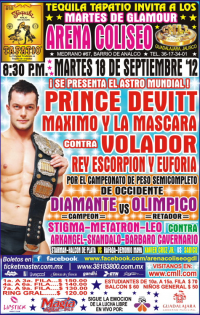 Olimpico won the title, small packaging Diamante as he went for a leg hold. It was billed as the light heavyweight title, but Diamante was heavyweight champ and it's the physical heavyweight title. Tecnicos took 1/3. 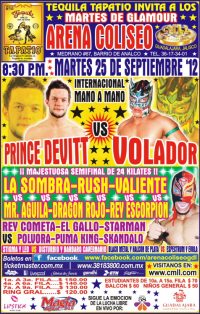 Volador fouled Devitt for the DQ. Pirata fouled Sagrada and pinned him for the win. 4) Académico, El Anini, Príncipe Azgard vs Ave Maligna, Blue Star, Willy Cortez Jr.
Relampago's team are champs and kept the titles. Terremoto turned on Mora. Guapito, the ex-AAA mascot, was accompanying the champs. Tecnicos took 2/3 to win. 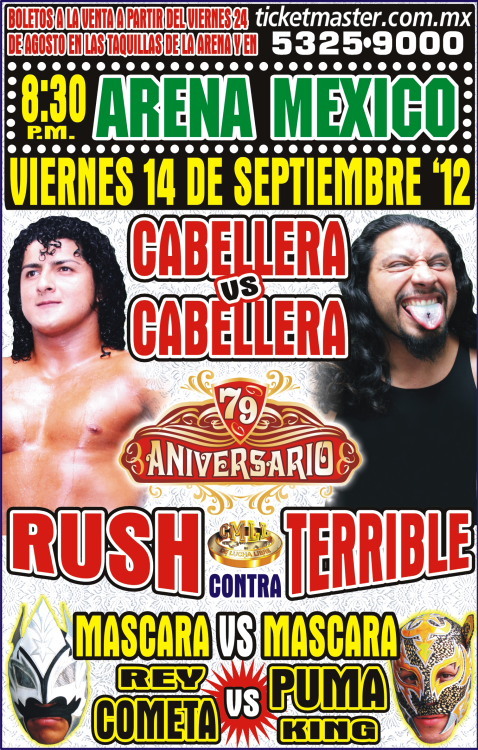 1) Sádico & Thunder Boy b Azteca de Oro & Javier Cruz Jr. In Memoriam got small revenge by beating the man who took his mask. Tecnicos took 1/3, Sagrado pinned Malefico for the deciding pin. Euforia got away with a foul on Titan to set up a singles match next week. 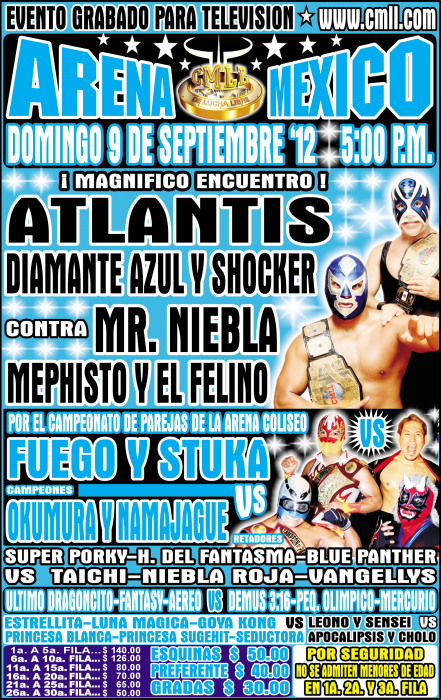 2) Face Man & Gitano Jr. b El Hijo De La Muerte & Norteño Jr.
UG tossed his mask to Atlantis for the DQ. 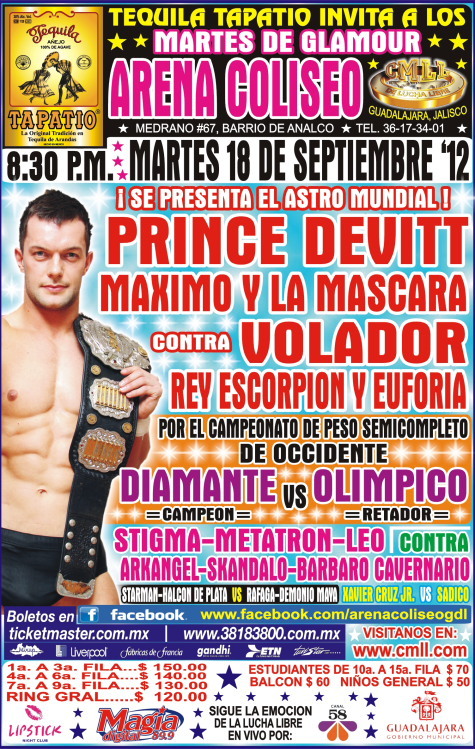 Event Notes: Show ran long because the CMLL guys were late from Satillo. Attendance was disappointed, blamed on rain. Rudos took 1/3. Zavala and Stigma faced off, but they didn't play the feud up this week. Rudos took 1/3, Demus dropping Astral with a double underhook piledriver. 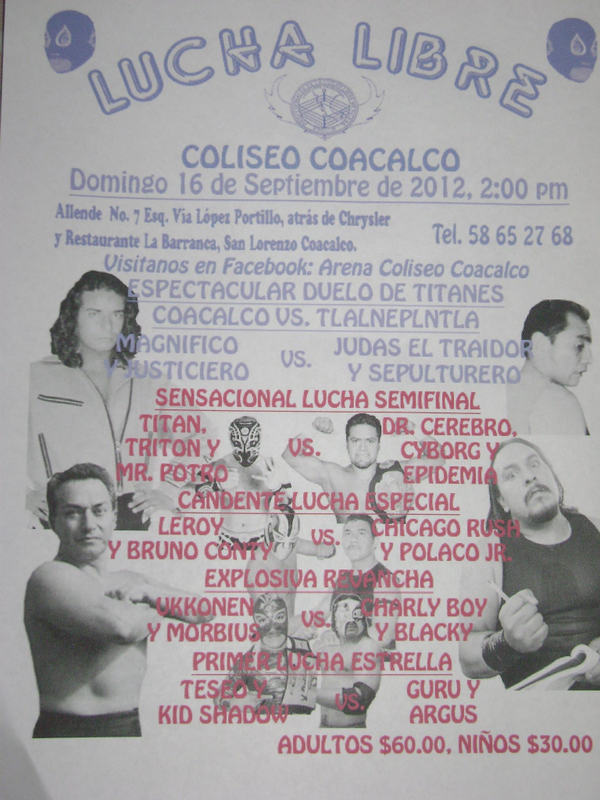 Tecnicos took 2/3, Fuego submitted Virus for the win and challenged for a title match. Very Cometa/King focused with the other guys not doing much. Puma won with a powerbomb. Mr. Aguila replaced Euforia. 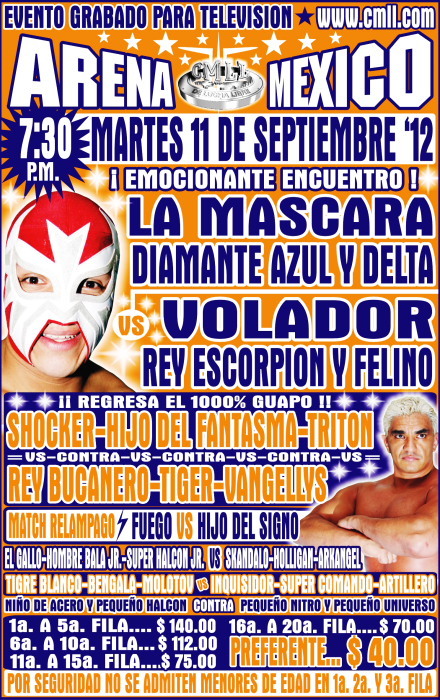 Tecincos won, but rudos stormed the ring after the match and took Valiente's mask. Volador won clean with a backcracker. Mije helped out early, finished sounded clean. Tecnicos took 1/3, excessive violence DQ in the third. 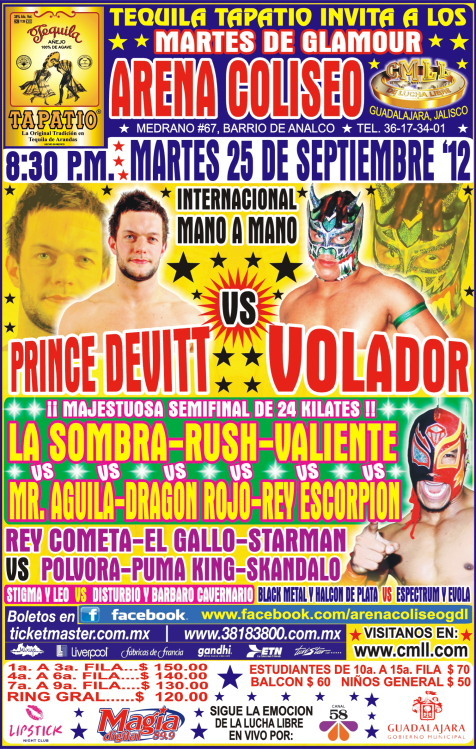 Averno replaced Volador, making this the first time he's faced Mistico. Tecnicso took 2/3. The two reports strongly disagreed on Mistico's performance - one saying he was much improved, one saying he did not do much. 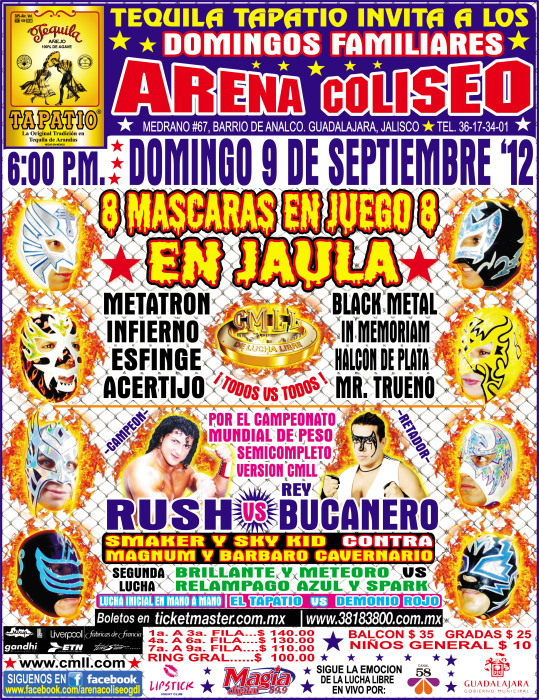 2) Latino Jr. & Pentagoncito vs Hijo del Espectro & Hijo del Espectro Jr.
Cibernetico, sides (Celestial, Fuego Dorado, Rey Cobra, Eufórico, Nahual y Fenix (Morelos) vs Krimen, Anubis, Raksas, El Juez, Tartu el Brujo y Elecktro) set by a battle royal. Hijo del Baron Siniestro was to present the trophy to the winner, but frequently helped the rudos. Final came down to Elecktro vs Eufórico, with Elecktro cheated out of the win. Eufórico, Hijo del Baron, and Drako beat up Elektro and revealed themselves as the new Dinastia Siniestra. 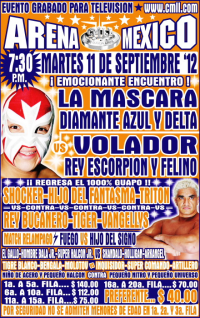 Event Notes: Princesa Blanca was at the show with Felino. Titan took 2/3. Foul for illegal headbutt by Euforia. Good match.